Cystolitholapaxy is a procedure to break up bladder stones into smaller pieces and remove them. Bladder stones are minerals that have built up in the bladder. Ultrasonic waves or lasers may be delivered through a tool called a cystoscope to break up the stones. 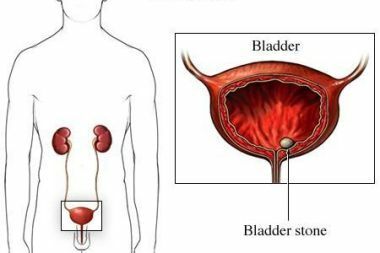 This procedure is done to treat bladder stones. This procedure can be done under local, spinal, or general anesthesia. It will block any pain. Sedation may also be used to ease anxiety. With local anesthesia, a special jelly or fluid will be inserted into your urethra. This will numb the area. If you are having spinal anesthesia, it will be injected into your spine. General anesthesia will make you stay asleep during the procedure. An instrument called a cystoscope will be placed through the urethra and into the bladder. The cystoscope has a camera that allows the doctor to see the stone. An ultrasonic probe or laser fiber is then passed through the cystoscope and used to fragment the stone. Stone fragments are flushed out of the bladder. The cystoscope is then removed. Depending on the type of anesthesia used, you may be able to move around after the procedure. You may still have a catheter inside your urethra. This is usually done in an outpatient setting. You will not need to stay overnight. The procedure takes 30-60 minutes depending on the size of the stones. Anesthesia prevents pain during the procedure. Ask your doctor about medication to help with pain after the procedure. During recovery, avoid difficult activity and heavy lifting until your doctor says it is okay to do so. Cystoscopy for women. Johns Hopkins Medicine website. Available at: https://www.hopkinsmedicine.org/healthlibrary/test%5Fprocedures/gynecology/cystoscopy%5Ffor%5Fwomen%5F92,P07723. Accessed March 8, 2018. Marickar YM, Nair N, Varma G, Salim A. Retrieval methods for urinary stones. Urol Res. 2009;37(6):369-376.